The Philippines Overseas Employment Administration (POEA) is an agency of the government of the Philippines which is mandated to open benefits of the overseas employment program of the Philippines. It is the main government agency assigned to check and monitor recruitment agencies for Filipino workers who will work in our country and in abroad where Filipinos rights are protected. In order to know the available jobs in other countries and its legitimacy, you can open the POEA website to know furthermore. The first thing to do is to go to POEA website link (www.poea.gov.ph/cgi-bin/jobvacancies/jobsmenu.asp) where you can check the jobs order. Once clicking the link, the page will now start to load and there will be 3 links to appear where you can search available job orders by country, position or by recruitment agencies. Select one which you know will give you what you are looking for. If you decide to open the link ‘’search available job orders by position’’ you can enter your desired job position in the toolbar. After it, you can now sort the result by date, country or agency. For the next option, you can check POEA Job orders by country. Of course, here you can search your job position through countries which will appear in the drop down selection. By clicking the submit button, all the available job positions will appear in the specific country you selected. The last choice you can be able to check the POEA job orders is by agency. 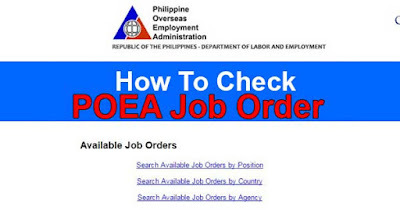 If you wanted to open the link on ‘’search available job orders by agency’’ it will take you to the page where you can also choose the job position available under POEA licensed recruitment agency from all the choices. If you plan to look for a job, you can always use the website of POEA to save you from illegal recruiters in the future and where you can be also able to save more money and efforts. im ireen valenzuela 42 yrs.single mom.i need a job in abroad .i dont have experience but i do the household chores like cleaners,housekeeping.even i have one right eye just like others i can work normally.im willing to learn and to be train. Im looking for job .. in Qatar,, im willing to work ,,i have a lot of experience.. like sales clerk, merchandiser, and baker thank you.